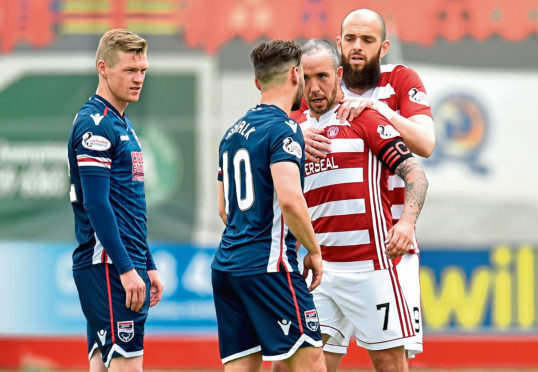 Hamilton's Dougie Imrie exchanges words with Ross County's Alex Schalk. Dutch forward Alex Schalk has painful memories of suffering relegation in his homeland but he is refusing to entertain thoughts of suffering a similar fate with Ross County. Schalk was part of a Go Ahead Eagles side that lost its Dutch Eredivisie status courtesy of a loss to De Graafschap in 2015, shortly before he moved to Scotland with County later that year. With the Staggies two points adrift at the foot of the Premiership with just two games remaining, Schalk knows the heat is on his side in their bid to avoid demotion to the Championship. Schalk remains hopeful he can avoid a similar outcome to the one he faced three years ago. He said: “It’s hard. I’ve been in a similar situation in Holland before so I know how to deal with it. “We got out of the direct relegation positions but lost in the play-off and went down. “The club had a plan A and a plan B – one if we stayed up and another if we went down. The structure at the club was really good. Everyone was disappointed and we had to cut employees but the club had a very good structure and they came out of it the next year and came straight up. County came from a goal behind to draw 1-1 with nearest challengers Partick Thistle on Friday night in a match where defeat would have left the Dingwall men five points adrift and all but relegated. Schalk insists the fightback against the Jags is proof the Staggies are still alive and kicking ahead of tomorrow night’s crucial home match against Dundee. The 25-year-old added: “The comeback characterises us. A lot of things have gone against us but that’s the way it is if you’re bottom of the table – the luck doesn’t go in your favour and sometimes you need that. “It wasn’t really falling for us and we needed to thank Scott Fox for the save he made and Marcus Fraser for putting his body on the line. At least we didn’t lose and we are still in it. “We’re not giving up, no chance. The spirit in the team has been really good. There’s a plan to get the game in our favour and you saw that in the second half when we changed our formation. “We should have scored in the second half and maybe deserved a penalty for handball.